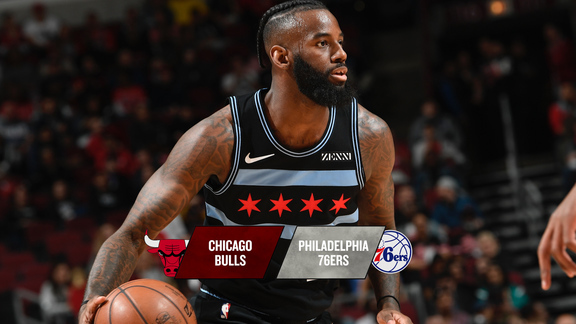 Tonight the Chicago Bulls (18-47) and the Philadelphia 76ers (41-23) get together for the second time, but for the first at the United Center. The teams opened the 2018-19 campaign against one another back on October 18th in Philly, with the Sixers running away with a 127-108 victory. Second-year playmaker Ben Simmons got off on the right foot in posting a triple-double (13 points, 13 rebounds and 11 assists) on Opening Night, while big man Joel Embiid dominated from the start, putting up a dozen points inside the first five minutes of the game, and finishing with a 30 and 12 (rebounds) night. Chicago’s Zach LaVine connected on 11-of-19 from the field to end up as high man for the Bulls with 30 points, while Ryan Arcidiacono came off the bench and handed out a team-best eight assists. 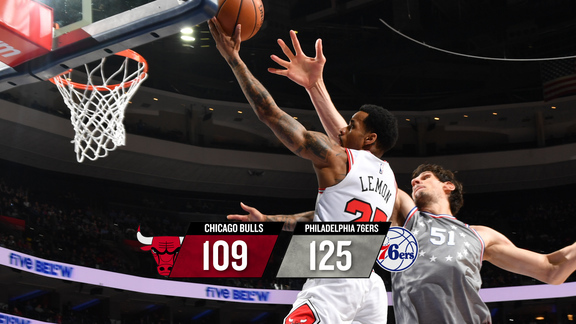 Both the Bulls and Sixers tonight are completing back-to-back sets, with Chicago looking to bounce back after coming up short last night in Indiana, 105-96, while Philadelphia tries to keep rolling along after overpowering Orlando, 114-106, yesterday in Philly. Despite winning seven of their last 10 games, the Sixers are limping into town this evening as Embiid did not make the Windy City trip due to a sore left knee. Tonight will be the seventh straight game the charismatic 7’0” pivot has been forced to skip. In the 54 games he has played, Embiid is averaging 27.3 points, 13.5 rebounds and 1.9 blocks. Even without their big man in the middle, the Sixers still shot 47.2% from the field against the Magic, and forced 12 turnovers last night. They attacked the hoop at will and made their way to the free throw line, going 19-for-21 from the stripe. Veteran guard JJ Redick led the way with 26 points, and grabbed five rebounds, while Tobias Harris chipped in an additional 21 points, 12 rebounds, five assists and two steals. Simmons came close to netting another triple-double with 16 points, 13 rebounds and eight assists. However, Embiid’s primary backup, 7’3” Boban Marjanovic, wasn’t able to take the floor last night and is likely out again today with his own knee issues. Another giant, Jonah Bolden, was sidelined with a sinus infection and is listed as doubtful tonight as well. In their place the Sixers recalled second-year center Justin Patton from their G League squad, and slid power forward Amir Johnson to the middle to hold down the fort. Johnson is also battling a number of aches and pains, primarily in his upper back, but notched 14 points in 20 minutes nonetheless. So far the Sixers are 4-2 in games Embiid has missed. That’s because the aforementioned Simmons and recently acquired Harris have stepped up to help carry the load. On Monday Simmons was named the Eastern Conference Player of the Week after averaging 16.7 points, 13.3 rebounds, eight assists, two steals and one block over three games last week. As for Harris, he’s been nothing short of special since arriving in the City of Brotherly Love, averaging 21.6 points while shooting 52.3% from the field, including 39.1% from deep over 10 games. And let’s not forget about former Bull Jimmy Butler, who made his way from Minnesota to Philly earlier this season. In 42 games with the Sixers, the four-time All-Star (three with Chicago), is averaging 18.5 points, 5.1 rebounds and 4.0 assists in 33 minutes a night. Despite the loss last night to the Pacers, the Bulls have been playing at a high level lately, averaging 118.5 points a game over their last 11, going 6-5 during this stretch. Lauri Markkanen and Zach LaVine have really come into their own this season. After a 14-point, 14-rebound effort against Indiana yesterday, Markkanen is averaging 24 points and 12.9 rebounds over his last 11 games. LaVine hit for 27 against the Pacers, and he’s been going off for 25.9 points, 4.9 rebounds and 5.6 assists over the same 11-game span. Forward Otto Porter Jr., who arrived from Washington the night before the NBA trade deadline last month, has also proven to be a vital player for the Bulls, who are 6-3 when he’s in the lineup. It’s easy to see why as the 25-year old small forward has averaged 18.3 points and 5.7 rebounds while hitting 49.6% of his shots overall, and 49.0% from behind the arc as a Bull. For Chicago pull-off an upset this evening they’re going to have to shoot a whole lot better than they did against Indy — particularly from distance. Overall the Bulls shot 36-for-93 (38.7%) from the field, including 4-for-25 (16.0%) from deep. They posted just 16 assists, which mostly is a byproduct of lousy marksmanship. To turn the tables the Bulls will need to do a better job of keeping the ball on the move and making sure everyone gets involved in the action. The ball has to touch everyone’s hand and freely skip from side-to-side and from player-to-player in order to force Philadelphia to scramble and cover a lot of ground defensively. To that end, collectively, Chicago will also need to sport a strong-willed mindset at both ends of the floor, demonstrating from start-to-finish a willingness to be physical on defense and persistent when it comes to attacking the basket. Both offensively and defensively the Bulls will also need to take advantage of Embiid’s absence by powerfully taking command of the boards and look to speed things up by getting out on the break as often as possible to post easy scores before the defense has time to set up. Likewise, the Bulls will need to stay focused and look to sprint back defensively to thwart Philly’s hopes of running a fastbreak attack. Simply put, from the opening tip until the final buzzer the Bulls are going to need to commit to outworking and outhustling the 76ers in every way possible.